Polka dot make-up bags made in lovely soft oilcloth making them wipeable and durable. 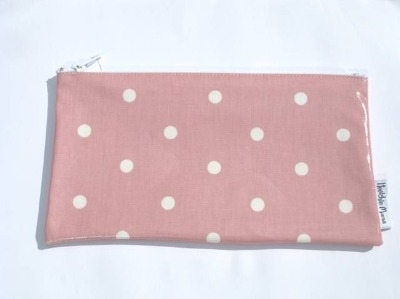 Soft Pink Polka Dot make-up bag made in lovely soft oilcloth making it wipeable and durable. A beautiful bag for keeping your make-up in, to use as your pencil case or even to tame all those things you must have in your handbag! Make-up bag measures 26cm x 14cm. Closes with a white zip across the top.